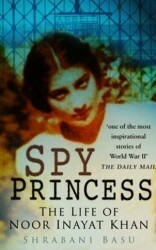 This is the riveting story of Noor Inayat Khan, the descendant of an Indian Prince Tipu Sultan, the Tiger of Mysore, who became a British secret agent for SOE during World War II. Shrabani Basu tells the moving story of Noor’s life from her birth in Moscow – where her father was a Sufi preacher – to her capture by the Germans. Noor was one of only three women SOE awarded the George Cross and, under torture, revealed nothing but her name – but not her real name, nor her code name, just the name she used to register at SOE: Nora Baker. Kept in solitary confinement, chained between hand and feet and unable to walk upright, Noor existed on bowls of soup made from potato peelings. Ten months after she was captured, she was taken to Dachau and, on 13 September 1944, she was shot. Her last word was ‘Liberte’. It's one of the most inspirational stories of World War II; reading this book is like watching a butterfly trapped in a net.